The First Opium War or the First Anglo-Chinese War was fought between the British East India Company and the Qing Dynasty of China from 1839 to 1842 with the aim of forcing China to allow free trade, particularly in opium. The Treaty of Nanjing, first of the unequal treaties, granted an indemnity to Britain, opening of five Treaty Ports, and the cession of Hong Kong Island, ending the monopoly of trading in the Canton System. The wars are often cited as the end of China’s isolation and the beginning of modern Chinese history. During the 19th century, trading in goods from China was extremely lucrative for Europeans and Chinese merchants alike. Due to the Qing Dynasty’s trade restrictions, whereby international trade was only allowed to take place in Canton (Guangzhou) conducted by imperially sanctioned monopolies, it became uneconomic to trade in low-value manufactured consumer products that the average Chinese could buy from the British like the Indians did. Instead, the Sino-British trade became dominated by high-value luxury items such as tea (from China to Britain) and silver (from Britain to China), to the extent that European specie metals became widely used in China. Britain had been on the gold standard since the 18th century, so it had to purchase silver from continental Europe to supply the Chinese appetite for silver, which was a costly process at a time before demonetization of silver by Germany in the 1870s. In casting about for other possible commodities to reverse the flow of silver out of the country and into China, the British discovered opium. Opium as a medicinal ingredient was documented in texts as early as the Ming dynasty but its recreational use was limited and there were laws in place against its abuse. It was with the mass quantities introduced by the British motivated by the equalization of trade that the drug became prevalent. British importation of opium in large amounts began in 1781 and between 1821 and 1837 import increased fivefold. The drug was produced in the traditionally cotton growing regions of India under British government monopoly (Bengal) and in the Princely states (Malwa) and was sold on the condition that it be shipped by British traders to China. 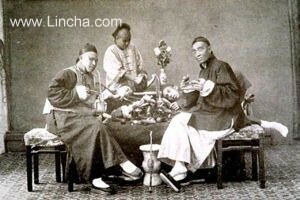 The Qing government had largely ignored the problem until the drug had spread widely in Chinese society. Alarmed by the reverse in silver flow and the epidemic of addiction (an estimated 2 million Chinese were habitual users), the Qing government attempted to end the opium trade, but its efforts were complicated by corrupt local officials (including the Viceroy of Canton). 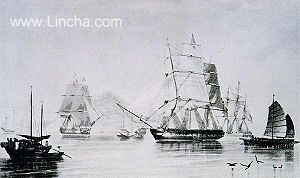 In one isolated incident, in 1818, the Laurel carried word to Sydney of a US ship laden with opium and treasure which was invaded by Chinese pirates. The crew of the US vessel had all been killed, but for the escaping first mate, who later identified the pirates to the authorities. In 1839, the Qing Emperor appointed Lin Zexu as the governor of Canton with the goal of reducing and eliminating the Opium trade. 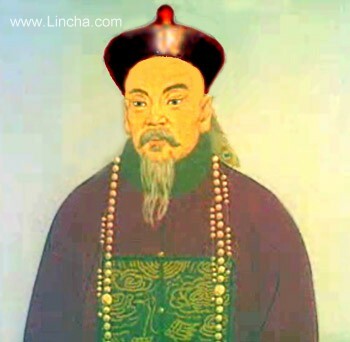 On his arrival, Lin Zexu banned the sale of opium, asked that all opium be surrendered to the Chinese authorities, and asked that all foreign traders sign a ‘no opium trade’ bond the breaking of which was punishable by death. He also forced the British hand by closing the channel to Canton, effectively holding British traders hostage in Canton. The British Chief Superintendent of Trade in China, Charles Elliot (who, surprisingly, broke the blockade to arrive in Canton) got the British traders to agree to hand over their opium stock with the promise of eventual compensation for their loss from the British Government. (This promise, and the inability of the British government to pay it without causing a political storm, was an important cause for the subsequent British action). Overall 20,000 chests (each holding about 55 kg) were handed over and destroyed beginning June 3, 1839. Following the collection and destruction of the opium, Lin Zexu wrote a "memorial" (摺奏) to the Queen of Great Britain in an unsuccessful attempt to stop the trade of the drug, as it had poisoned thousands of Chinese civilians (the memorial never reached the Queen).